This chair and a half offers extra space for lounging. 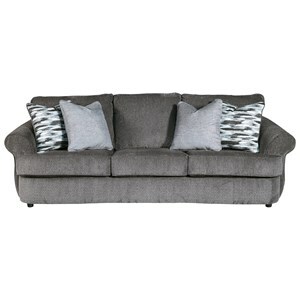 Large rolled arms, a plush back cushion, and shaped front create an inviting design. 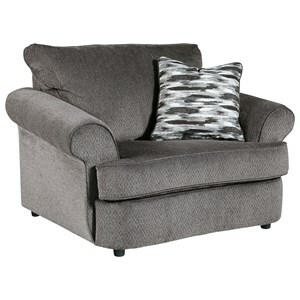 Textured gray fabric and an accent pillow with an abstract print on one side completes the chair's look. 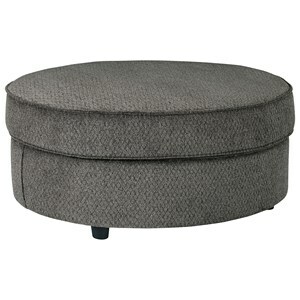 The coordinating oval ottoman completes the chair and ottoman set. The Allouette Chair and a Half & Oval Ottoman in Gray Fabric by Benchcraft at VanDrie Home Furnishings in the Cadillac, Traverse City, Big Rapids, Houghton Lake and Northern Michigan area. Product availability may vary. Contact us for the most current availability on this product. 9350414 Ottoman 1 41" 31" 19"
9350423 Chair and a Half 1 54" 40" 38"
Curved shapes abound in this living room furniture collection. 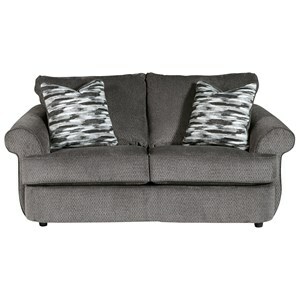 Generously scaled, each piece has contemporary style and a textured gray fabric for a unique flair. The Allouette collection is a great option if you are looking for Contemporary furniture in the Cadillac, Traverse City, Big Rapids, Houghton Lake and Northern Michigan area. 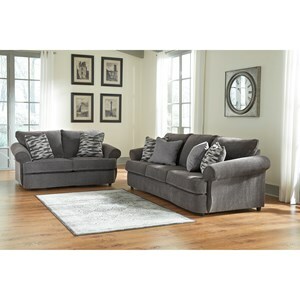 Browse other items in the Allouette collection from VanDrie Home Furnishings in the Cadillac, Traverse City, Big Rapids, Houghton Lake and Northern Michigan area.